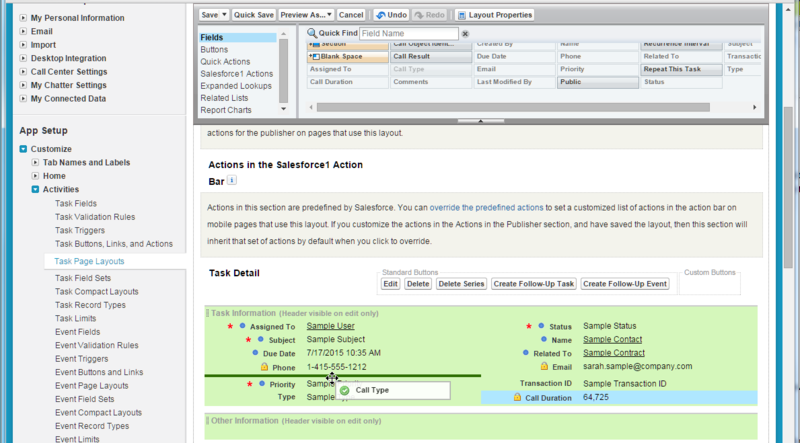 Every phone call creates a call log which is stored as a task in Salesforce. This task can have five states which can be configured by the administrator. The 8x8 app creates a task in complete status. A call log saved as a task stores information on call duration, outcome, type, start time, end time, priority, status, link to call recordings etc. Some of these fields are already available in Salesforce task object, while others need to be created and added to the task page layout. This calls for customization of task object. 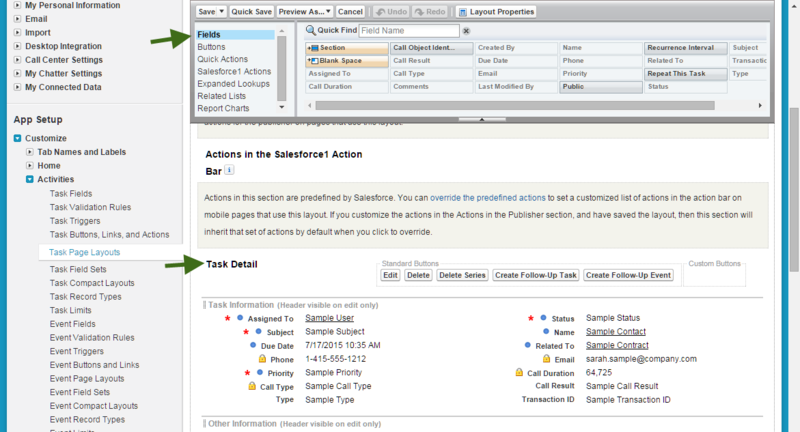 The standard task fields in Salesforce may be not visible in the task view by default. This is controlled in the task page layout. To add these fields, you should edit the layout. Search for task page layout or navigate to Customize > Activities > Task Page Layouts. Select to edit the task page layout. In header area, select Fields to view all the standard fields in task object. Select the field you wish to add to the layout, drag and drop it in the Task Detail area below. Repeat this step for all fields to be added to the layout. We recommend adding custom fields for call duration, call result, call type, and call recording. The call log generated by Virtual Office for Salesforce Communication Panel provides information such as call start time, end time and extension number that handled the call. The task object in Salesforce does not provide standard fields to store this data. 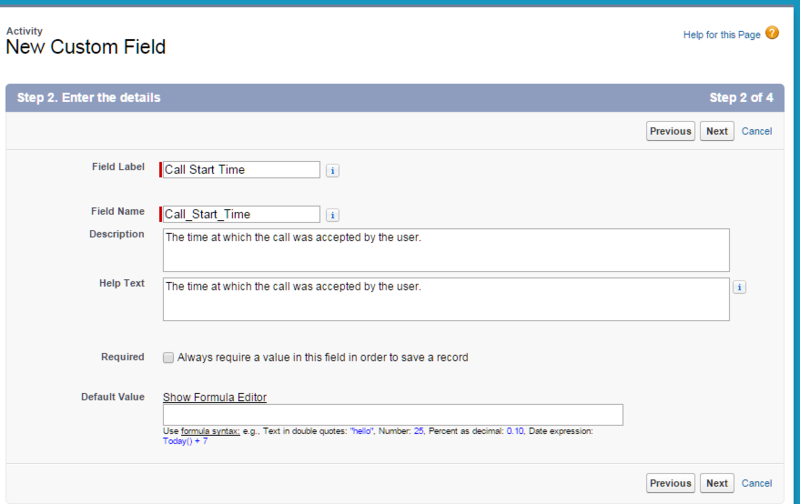 You can create custom fields and map the data from the call log to the custom fields. 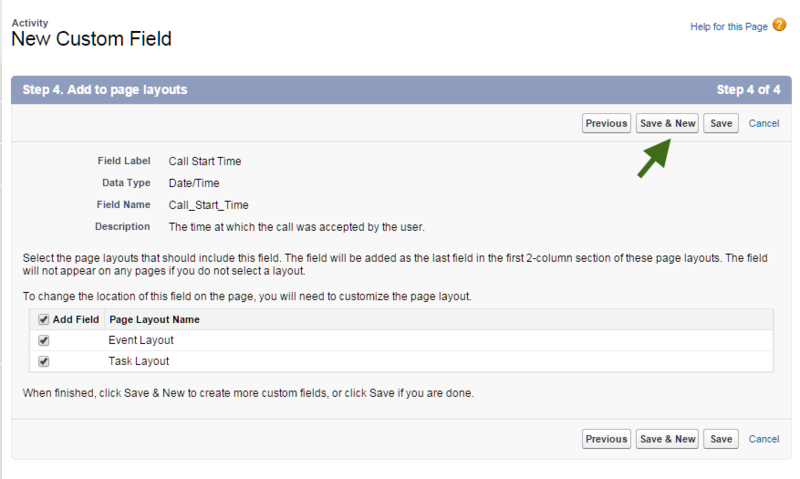 We recommend adding new custom fields for Call start time, end time, and extension number that handled the call. 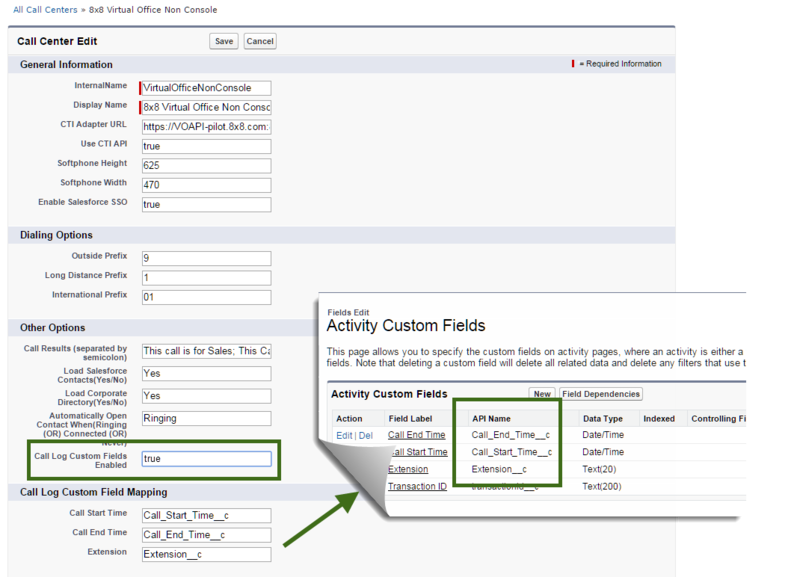 In Setup, navigate to Customize > Activities > Activity Custom Fields. OR Search for Activity custom fields and click on the resulting link in the navigation tab. In Activity Fields, click New to begin creating a new custom field. Select the data type from the list and click Next. For call recording, choose data type URL. Enter the field details: Field Label, Field Name are mandatory. Click Next to proceed to the field level security. Select the profiles to which you want to grant edit access to this field via field-level security. Click Next. Add the new custom field to the task page layout. Click Save or Save and New to create another custom field. Repeat this process to add all the required custom fields. Go to Setup > Customize > Call Center > Call Centers. Select to edit the Virtual Office for Salesforce Communication Panel. Set Call Log Custom Fields Enabled to <true>. Set Call Log Call Recording Enabled to <true>. Set Enable Salesforce SSO to true. In the Call Log Custom Field Mapping, enter the API Name for all custom fields added to the call log. You can copy and paste it from the Activity Custom Fields. To validate the customization of call log, open a call log after the customization was completed. You will notice the call log data is now stored in the relevant fields instead of the Comments field.